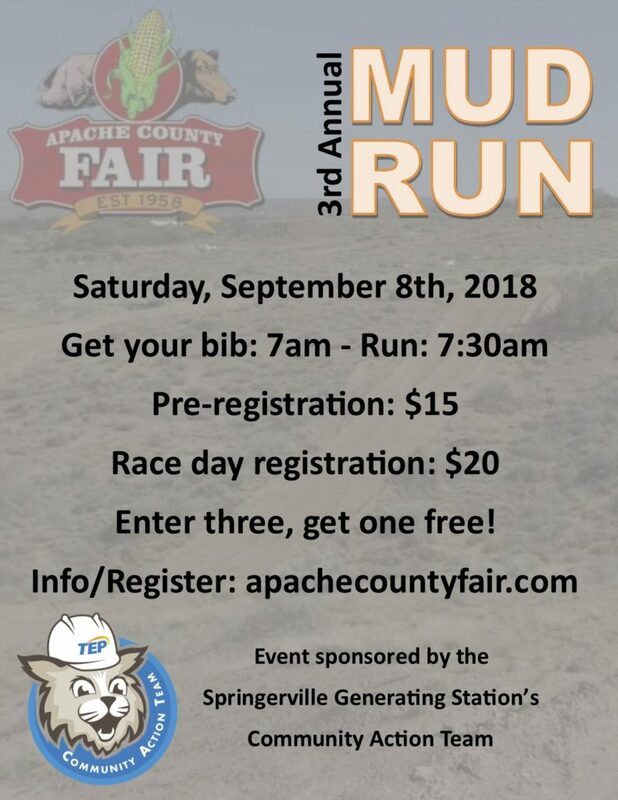 I, the undersigned, Apache County Fair 5K Mud Run Participant (the “Participant”), or the parent or legal guardian of the undersigned Participant, if the Participant is under the age of 18 (such Participant, parent or legal guardian shall be referred to herein as the “Releaser”), hereby accept the invitation of the Apache County Fair Committee to participate in the Apache County Fair 5K Mud Run, a 5K walk/run to be held on September 8th, 2018 in St. John’s, Arizona I am voluntarily participating in this 5K on my own time and I agree that my participation is not a condition of my employment or involvement in the Apache County Fair. THE RELEASOR VOLUNTARILY ASSUMES ALL RISKS AND HAZARDS WHICH MAY CAUSE INJURY, DAMAGE, OR LOSS TO THE PARTICIPANT OR TO HIS/HER PROPERTY OR ANY PROPERTY IN HIS/HER POSESSION, WHILE PARTICIPATING IN, AT OR EN ROUTE TO OR FROM THE EVENT. THE RELEASEOR HEREBY SPECIFICALLY RELEASES, INDEMNIFIES, AND HOLDS HARMLESS THE APACHE COUNTY FAIR COMMITTEE, TUCSON ELECTRIC POWER COMPANY’S COMMUNITY ACTION TEAM, ITS MEMBERS, OFFICERS, REPRESENTATIVES AND AGENTS, FROM ANY CLAIM, LOSS, LIABILITY, DEMAND, DAMAGES OR LOSS OF ANY KIND TO THE PARTICIPANT OR TO HIS /HER PROPERTY OR ANY PROPERTY IN HER/HER POSESSION, WHETHER CAUSED BY THE ACTS OR OMISSIONS OF THE APACHE COUNTY FAIR COMMITTEE OR ANY OF THE PERSONS MENTIONS ABOVE, THE ACTS OR OMISSIONS OF OTHER Participants OR OTHER THIRD PARTIES. a. The Releaser authorizes The Apache County Fair Committee and/or its representatives to voluntarily and gratuitously perform on-site treatment for the injury, condition or complication, and/or to voluntarily and gratuitously provide transportation for the purpose of obtaining treatment elsewhere. The Releaser expressly recognizes that any on-site treatment will not necessarily be performed by persons having medical training, including as emergency medical technicians, and the Releaser acknowledges that The Apache County Fair Committee has in no way represented that this treatment will be performed by persons having such training. The Releaser further understands that neither The Apache County Fair Committee nor its representatives who perform any on-site treatment and/or provide any transportation for the purpose of obtaining treatment elsewhere will expect or accept any remuneration for the same. Therefore, and in return for this voluntary and gratuitous treatment and/or transportation, the Releaser specifically releases, indemnifies, and holds harmless The Apache County Fair Committee and its stakeholders, officers, directors, employees, representatives, and agents, from any claim, loss, liability, demand, damages, or costs (including attorney’s fees) of any kind of the Participant resulting from such treatment and/or transportation, whether caused by the acts or omissions of the persons performing the treatment and/or providing the transportation, or otherwise. b. The Releaser also authorizes The Apache County Fair Committee and/or its representatives to make arrangements with third parties for medical treatment for the injury, condition or complication, including but not limited to emergency, laboratory, diagnostic, and/or surgical treatment, and/or to make arrangements with third parties for transportation for the purpose of obtaining such treatment. The Releaser expressly gives his/her consent for this treatment and/or transportation to any emergency medical services, physicians, nurses, other medical personnel, hospitals, and/or medical transportation services that The Apache County Fair Committee, in its sole direction, may select, and the Releaser specifically agrees that the Releaser will assume full responsibility for payment for such treatment and/or transportation. Finally, the Releaser acknowledges that he/she has carefully read and fully understands all of the provisions set forth in this Consent and Release, and has freely and voluntarily chosen to agree to the same. This consent and Release shall be biding upon the heirs, administrators, executors and assigns of the Participant. Make sure you have accepted the terms before clicking "Agree, Register, and Pay via PayPal"